Tanveer, B., et al. Mitochondrial Myopathy In Old Age: A Case Report. (2016) J Anesth Surg 3(1): 90-91. © 2016 Tanveer, B. This is an Open access article distributed under the terms of Creative Commons Attribution 4.0 International License. Mitochondria are intracellular organelle involved in ATP production present in all cells except erythrocytes. Historically mitochondrial diseases were considered to be neuromuscular disease. Mitochondrial disease, once thought to be a rare clinical entity, is now recognized as an important cause of a wide range of neurologic, cardiac, muscle, and endocrine disorders. Kearns Sayre syndrome is a rare mitochondrial disease, Involving deletion of mitochondrial DNA. It has three phenotype KSS, Pearson syndrome and Progressive external opthalmoplegia. In 1958 first case was reported. The incidence of KSS is 1 to 3 cases per100000 population. A 67 year old female patient admitted in gynecology ward with diagnosis of procedencia for vaginal hysterectomy. Her past medical history showed that she is known asthmatic on inhaler, Rheumatoid arthritis and Depression. She develops progressive muscle weakness especially extra ocular muscle so unable to open her eyes, due to skeletal muscle weakness she even become functional class three. Her ECG showed normal rhythm and no conduction abnormality, ejection fraction 55%, Hemoglobin and Electrolytes were within normal limit. Keeping in view that general anesthetics usually act on mitochondria we opt regional anesthesia for this case. 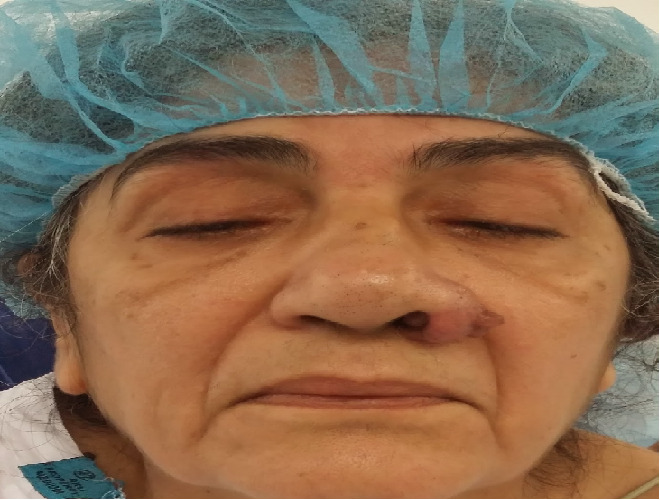 Patient tolerated procedure well and no complications were identified within 24 hours and patient discharged from the hospital in following week. Pertaining to anesthesia management we try to avoid giving neuromuscular agent. Spinal anesthesia were planned with Bupivacaine 8mg and 25ug fentanyl after all aseptic measure L3 L4 space identified local anesthesia xylcaine 1% injected through 27 gauge needle then trocar introduced in L3 L4 intervertebral space than 25 gauge pencil point spinal needle passed through it when free flow of cerebral spinal fluid seen drug bupivacaine 8mg and 25 micro gram fentanyl loaded slowly then immediately patient positioned changed from sitting to supine blood pressure reading adjusted to one minutes after few minutes level of block cheeked with pin prick and ice cubes. when level of block achieved we asked surgeon to start positioning for surgery. Initially blood pressure went down to more than 20% of initial reading so ephedrine in titrated doses given. There were no bradycardia or arrthymia encountered. During whole surgery we especially paid attention to pressure area because of generalized weakness. Viginal hysterectomy finished within two hours uneventfully. Patient was monitored postoperatively in post anesthetic care unit, she remained vitally stable and no adverse event happened, shown in figure. The mitochondrial myopathies consist of a heterogeneous group of disorders caused by structural and functional abnormalities in mitochondria leading to involvement of the nervous system and muscles as well as other organ systems. The peculiar genetic characteristics of mitochondrial DNA impart distinctive properties to these disorders. Metabolic Myopathies (MM) are rare inherited primary muscle disorders that are mainly due to abnormalities of muscle energy metabolism resulting in skeletal muscle dysfunction. These diseases include disorders of fatty acid oxidation, glycogenolytic muscle disorders and mitochondrial respiratory chain (MRC) disease. As these patient may underwent any surgical procedures the best anesthesia options is a main consideration for an anesthetist to avoid any complication due to anesthetic drugs. Anesthetic management of patients with mitochondrial myopathies should begin with careful investigation of the medical history and a complete physical examination to exclude possible associated comorbidities, as well as hypotonia, cardiac dysrhythmias, epileptic seizures, stroke-like episodes, gastrointestinal dysmotility, diabetes, and lactic –acidosis[4,6]. Mitochondrial disease represents probably hundreds of different defects, both genetic and environmental in origin, and is thus difficult to characterize. The specter of possible delayed complications in patients caused by inhibition of metabolism by anesthetics, by remaining in a biochemically stressed state such as fasting/catabolism, or by prolonged exposure to pain is a constant worry to physicians caring for these patients. Here, we review the considerations when caring for a patient with mitochondrial disease. Keeping in mind the literature review of the choice of anesthesia consideration in patient with mitochondrial myopathies we decided to opt for spinal anesthesia and it was found to be safer choice. 1. Munnich, A. Defects of the respiratory chain. (2006) Inborn Metabolic Diseases 197–209. 2. Moraes, C.T., DiMauro, S., Zeviani, M., et al. Mitochondrial DNA deletions in progressive external ophthalmoplegia and Kearns-Sayre syndrome. (1989) N Engl J Med 320(20): 1293-1299. 3. Schaefer, A.M., McFarland, R., Blakely, E.L., et al. Prevalence of mitochondrial DNA disease in adults. (2008) Ann Neurol 63(1): 35-39. 4. Shipton, E.A., Prosser, D.O. Mitochondrial myopathies and anaesthesia. (2004) Eur J Anaesthesiol 21(3): 173–178. 5. Olpin, S.E., Murphy, E., Kirk, R.J., et al. The investigation and management of metabolic myopathies. (2015) J clin pathol 68(6): 410-417. 6. Vilela, H., Garcia-Fernandez, J., Parodi, E., et al. Anesthetic management of a patient with MERRF syndrome. (2005) Paediatr Anaesth 15(1): 77–79. 7. Niezgoda, J., Morgan, P.G. Anesthetic considerations in patients with mitochondrial defects. (2013) Paediatr Anaesth 23(9): 785-793.